A few days ago in a post about global museum attendance, I mentioned that there were going to be a number of people voting across the world this year. In fact, that number is almost 3 billion. That’s right — over 3 billion people will be voting in an election this year. The total world population only broke 3 billion in the 1960s. 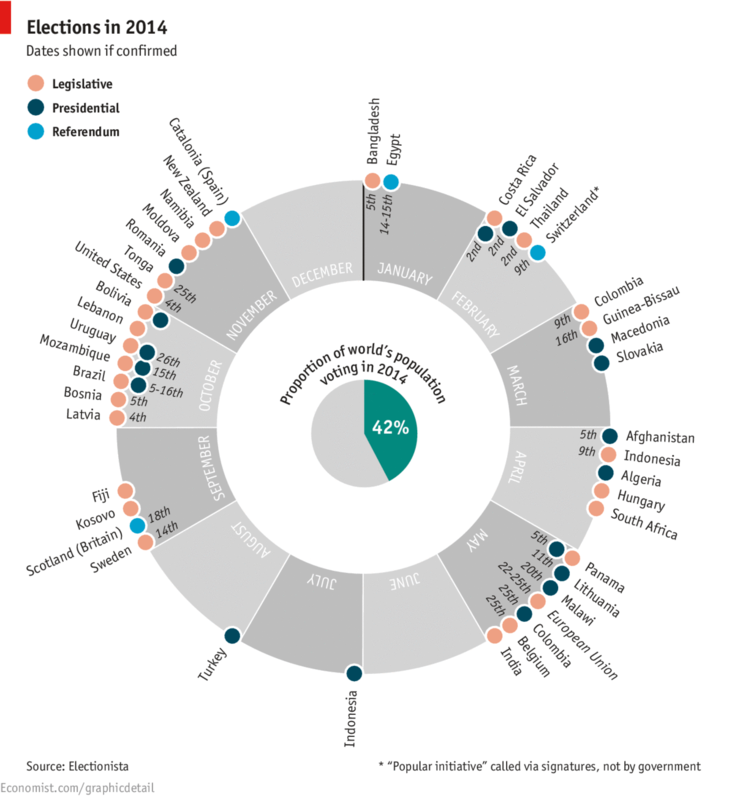 The Economist had a great graphic showing the different elections there was going to be this year and I thought it was worth taking a closer look at. For instance, as you might expect there are nearly no elections taking place during the summer months. In fact, from May to September, there are only 2 elections taking place, whereas, aside from December, there is only one month that has only 2 elections (January). Any election is important and has lasting repercussions, but one of the elections that I’m most interested to see the results of is the election in South Africa in April. This past November, South Africa opened voter registration and had over 2.5 million people register. Of those 2.5 million, 1 million were new voters. There will be another voter registration taking place in February of this year. There are quite a few people expecting the current party in power (African National Congress) to lose quite a bit of their support. Since 1994, all the Presidents of South Africa have been from the African National Congress (ANC). Currently, the African National Congress has almost 70% of the seats in the National Assembly. The polls are predicting the ANC to lose some of their seats. In fact, support is expected to drop nearly 10%. If this hold true, the ANC would still have a majority of seats in the National Assembly, but there are still many days between now and the election in early April. If that support were to dip below 50%, it would be the first time since 1994 that the ANC had less than 200 seats. Is There No Easier Way To Choose a President? I think this cartoon — while meant to be funny — also has a good point. The USA just went through one of the longest and most expensive campaigns — isn’t there an easier way to do this? I understand that some folks think that there might not be and I really don’t have a definitive answer to the question. I would look to some of the European countries like France where the campaign/election takes a fraction of the time as it does in the US. Or, there are the US’s neighbors to the North — Canada. An election is called and 6 weeks later, there is voting! I realize that the US has quite a larger population than Canada, but I wonder how much more productive the policymakers of the US would be if campaigning/elections were only 6 weeks long. Think about all the time that lawmakers spend at fundraisers or campaigning. Just about all of that time could then be reallocated to creating public policy! One would think that things might move along quicker, but who knows, maybe they wouldn’t. If you have an idea for how you think elections should run in the US, I’d love to hear. Let me/us know in the comments! 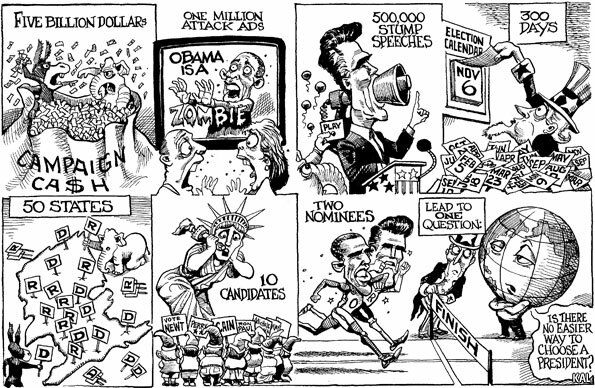 On the face of it, there certainly seems to be a need to reduce the time it takes to choose a President in the US. If we start counting the time all the way back to the primaries, it takes over a year to pick a President in the US. That certainly seems like a long time, especially given that some of these same people are also tasked with running the country.